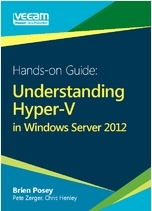 This “Hands-on Guide: Understanding Hyper-V in Windows Server 2012” is a detailed e-book providing you with simple step-by-step instructions for performing a variety of Hyper-V-related tasks. Upon reading this guide, you will be able to manage Hyper-V 3.0 infrastructures like a seasoned expert! This Hyper-V e-book (http://hyperv.veeam.com/backup-posey-henley-zerger-understanding-hyper-v-in-windows-server-2012-1726/) will guide you through Hyper-V management on both host and virtual machine levels. Understanding Hyper-V starts with an overview of hardware requirements, deployment of Windows Server 2012 with Hyper-V and methods of upgrade and migration from Hyper-V 2.0 to Hyper-V 3.0. You will learn how to create and migrate virtual machines and build a clustered Hyper-V deployment using different techniques to make your virtual machines fault tolerant. ← Click Here for More Titles!